Last month, New York City rolled out a bicycle-sharing system aimed at locals, tourists and office-goers. When will New Delhi or other Indian cities get one of its own? Urban centres around the world are dedicating a slice of their streets and transportation infrastructure to the friendliest mode of getting around—bicycles. By keeping brand new bikes at major city nodes to help people commute easily and comfortably, these sharing programmes extend high quality and in some cases free transportation combined with the best of modern technology. Information Technology, a term India loves because of her status as the software superpower, is the key in the bicycle-sharing systems, which uses technology to help users pick and drop their bikes at any points they want with only the click of a button. Then, why is it that none of the Indian cities has a bicycle-sharing system, a benchmark of the quality of life, it can boast of? In this feature article, we explore this question as we present successful models of bike sharing across the world to help understand how a bicycle-sharing system can be put in place, in your colony or campus, city or countryside. Situated about 190 km from Shanghai, the northern Chinese city of Hangzhou started its bike sharing system five years ago with a modest 2,800 bicycles. Today, the Hangzhou Public Bicycle, the largest in the world, has over 60,000 bikes, which help the city residents mainly as a last-mile connectivity to their destinations. 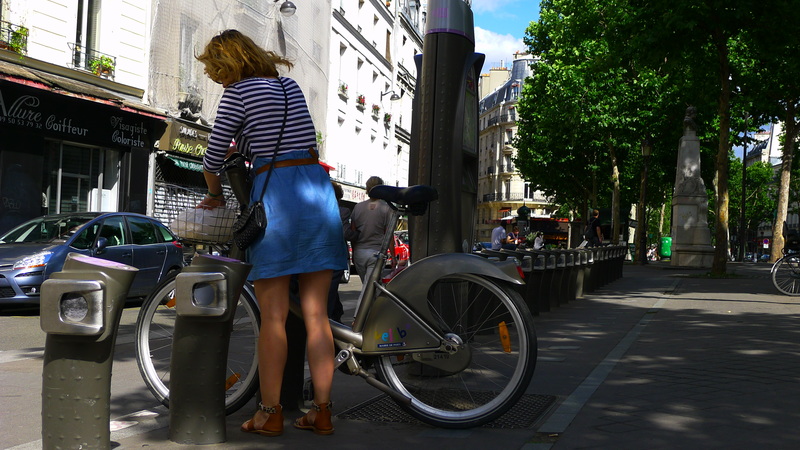 The hugely popular Velib bike-sharing programme in Paris is used by about 100,000 people every day, while Spanish city Barcelona’s Bicing has nearly 50,000 daily users. The first bike-sharing system is said to have originated in Amsterdam, in 1965. But Copenhagen, the capital of Denmark is credited with the first major bicycle-sharing system in the world, called City Bikes, launched a decade-and-a-half before it hosted the climate summit in 2009. Today, 40 per cent of Copenhagen’s population rides a bicycle to work. But the third generation bicycle sharing systems like the Velib of Paris, Hangzhou Pubic Bicycle and BikeMe of Milan uses software applications to take or deposit a bike at docking stations. There are even apps that identify the number of bicycles available at a particular docking station. New York was the newest addition to this growing list of bike-friendly cities when its CitiBike system was unveiled on May 27. But what about India? “Bicycle sharing hasn’t picked up in India yet, but gradually several Indian cities are showing interest,” says Shreya Gadepalli, Regional Director, India of the US-based Institute for Transportation & Development Policy (ITDP), which promotes environmentally sustainable transportation policies worldwide. In fact, Chennai in Tamil Nadu, Rajkot in Gujarat and Pune in Maharashtra are in the early stage of planning for a bicycle sharing system. “India is known around the world as the centre of Information Technology and the third generation bike sharing systems extensively use IT for system management. That makes it ideal for India to have its own bike sharing systems,” says Gadepalli. Use of software applications significantly bring down the cost of operation in a bike sharing system where tapping a smart card at a docking station is enough to pick or drop a bike. India, however, would need to create the basic infrastructure for the safe operation of a bike-sharing system, like building separate cycle tracks. While in small cities the bike-sharing system could work as an independent mode of transportation, in big centres it could work in conjunction with public mass transport. According to Raj Janagam, the brain behind ‘Cycle Chalao’, a bicycle sharing system launched in Mumbai in 2009, the use of bicycles as a transport mode should be “need-based” and not “desire-based”. 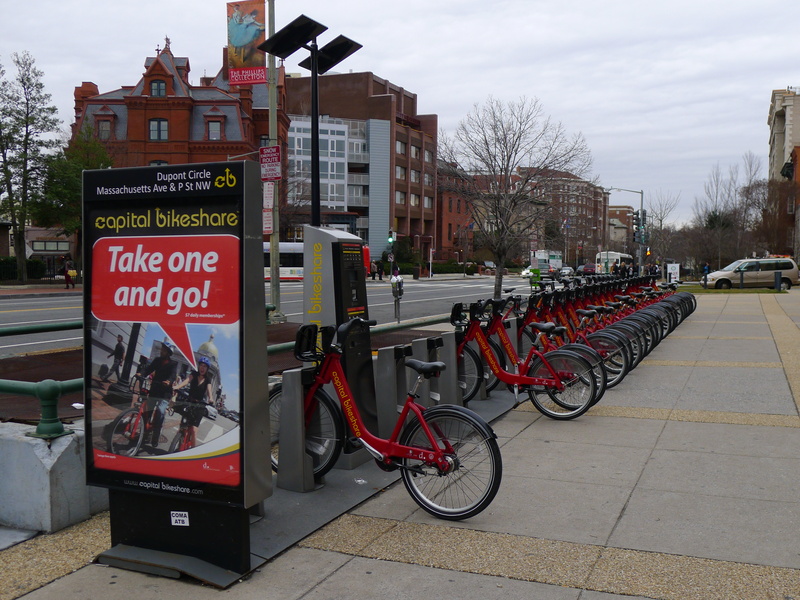 “Implementing bicycle sharing systems in small pockets doesn’t help. Good infrastructure and total ownership will make it a sustainable and dependable transport mode,” says Janagam, who still gets calls from people asking him to revive ‘Cycle Chalo’, which was run in two rail stations to help the poor and students for their last-mile connectivity. 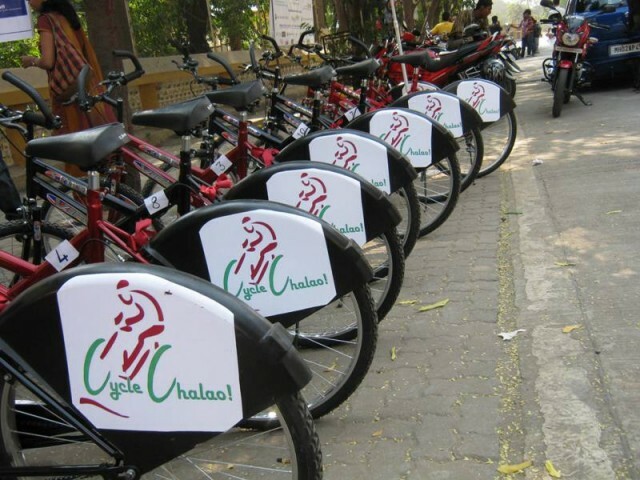 ‘Cycle Chalo’ was discontinued after it could not sustain revenue and municipal support. “The absence of a transport policy addressing bicycles, the lack of volume user, unsupported infrastructure and an ambiguous regulatory license are complete deterrent for any bicycle sharing initiative,” explains Janagam. “It should come as an inclusive transport system moved by volumes, driven by need and built as a culture, like in China,” he adds. According to Sudhir Gota, a former road designer and now a sustainable transport specialist, the mushrooming residential colonies in city suburbs could act as a catalyst for promoting bicycle sharing programmes in the country. “The tag line of most of the residential colonies springing up these days is healthy lifestyle and a bicycle sharing system is the best way to promote a healthy lifestyle,” says the Bangalore-based Mr Gota. The RWAs can launch the bicycle sharing systems because such a system does not need huge investment. “It is very cheap to have a bicycle sharing system. The residents of the colonies could hire the bicycles for free for rides in the neighbourhood. It is a small step, but it will a big measure for changing the mindset of the people,” Mr Gota says. Last December, India’s Ministry of Urban Development released a toolkit on how to create a bicycle-sharing system in India. “The toolkit contains useful information like how to plan, how much it would cost and what technology is to be used,” says ITDP’s Gadepalli, whose organization helped the Ministry in preparing the toolkit. The toolkit will certainly help in planning and implementing bicycle-sharing systems across the country, but the ultimate challenge lies in supporting such initiatives to sustain and grow and thus not meet the fate of ‘Cycle Chalao’. ‘Namma Cycle’ is a bicycle-sharing initiative on the campus of the Indian Institute of Science (IISc), Bangalore, started in 2009 for helping students use an environment-friendly mode of transport. Launched with only 50 bicycles, it today has over 100 bicycles and does it transactions electronically through the mobile phone compared to the slow record-keeping method before. “The main objective was to make the campus pollution free and protect our green infrastructure, Increasing ‘green-awareness’ among the youth gave us ‘bicycle’ as the best alternative to motorized transport,” says Murali H R, a creative consultant, who is the founder-director of ‘Namme Cycle’. Three years of research and planning went into establishing the ‘Namma Cycle’ project. “We did a lot of awareness campaigns on health and environmental benefits of cycling. The rising fuel prices also acted as catalyst in the implementation,” says Murali, who unsuccessfully tried to launch the initiative in an Information Technology hub, which Bangalore is famous for. “The mobility focus was tuned towards automobiles and building flyovers, and we faced biases against NMT. On the other hand educational institutions are more open to experimenting and facing bugs,” he says. Forty per cent of the users of ‘Namma Cycle’ are vendors on campus and project trainees who arrive for short visits. 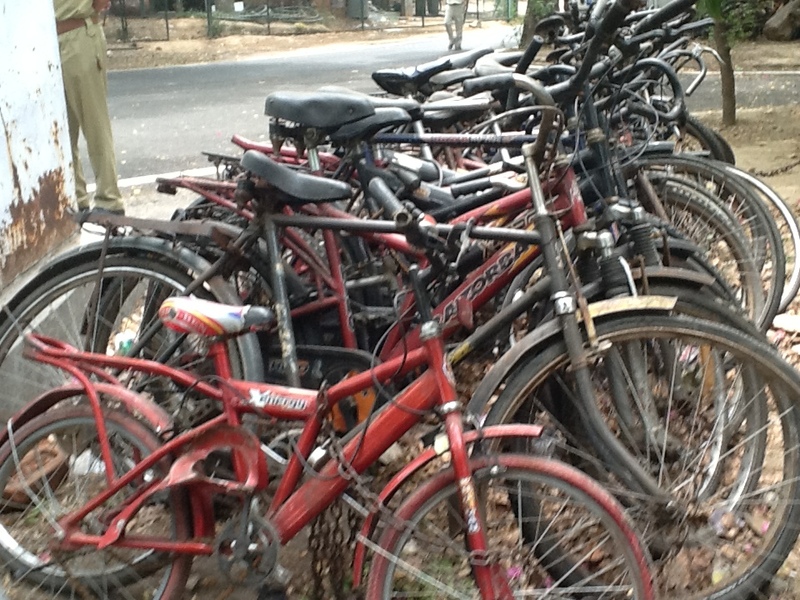 The 15-year-old Bicycle Bank of Indian Institute of Technology, Delhi (IIT-D) has 500 vehicles (cycles), most of which are currently in the possession of students. The IIT-Delhi’s Bicycle Bank was created with the old bicycles left behind by students who have completed their courses. The institute staff picks ups the old bicycles from hostels and add them to the bank after undertaking repairs if needed. The bicycles are given to students on loan and without charging any fee, but maintenance is the responsibility of the user. The bank also lends bicycles to the institute’s lower level employees who can’t afford new bicycles. “Our Bicycle Bank is the only one in the country among the IITs,” says Capt. B N Yadav, who is in-charge of the Bicycle Bank in IIT-Delhi. Capt Yadav, who gets visits from officials of other universities keen on emulating the IIT-Delhi model, explains: “As a policy we don’t allow motorised vehicles for boarders. We encourage our students staying on campus to use bicycles instead.” There are about 8,500 students on the campus of IIT-Delhi. “The use of bicycle as the only mode of transport by students helps the campus remain pollution-free,” adds Capt. Yadav. Released on 6 December 2012 at the Fifth Urban Mobility India Conference in New Delhi, the National Bicycle Sharing Scheme of the federal Ministry of Urban Development of India is a guide to creating a bike-sharing system. It features modern cycle sharing systems, planning process, creating bike stations, automated pick and drop, redistribution, use of mobile phone and the web in distribution and real-time information platforms. For further information, please click Public Cycle Sharing Systems: A Planning Toolkit for Indian Cities.